This is very respected and organized company that can offer flawless implementation of very useful cleaning services. All of them are performed by a team of hard working cleaners who are determined to deal with every spot or stain that bothers you. If you are too busy with your work or with other important activities this company will become your best when cleaning is concerned. The web server used by Cleanerswhitecity.net is run by Unlimited Web Hosting UK LTD and located in Great Britain. On this web server 33 other websites are hosted. The language of those websites is mostly english. 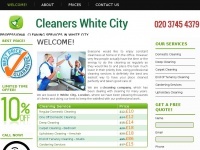 The Cleanerswhitecity.net websites were developed using the programming language PHP and served by a Apache server. For managing the data of the webpages the CMS WordPress in the version 4.8.1 is used. The website uses the latest markup standard HTML 5. The website does not specify details about the inclusion of its content in search engines. For this reason the content will be included by search engines.